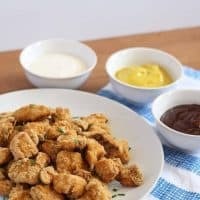 This recipe for baked graham cracker chicken tenders is perfect for a kids’ dinner or an adult snack! Easy and delicious! The first time I had a chicken tender was probably at a fast-food restaurant with golden arches (you know which one I’m talking about.) I probably loved it too. That was a very long time ago. And a lot has changed since then. The restaurant I mentioned above recently began a campaign talking about where their food comes from and how its made. After making my s’mores brownies, I still had a bunch of leftover graham cracker crumbs. I also had some chicken. Baked graham cracker chicken tenders happened, and they were delicious. They were also pretty easy to make. I combined all of the dry ingredients in a plastic bag, sealed it and then shook it (like a polaroid picture.) After dredging the chicken pieces in egg I threw them in the bag, tossed again and voila! Once out of the oven, you need to let them cool off a little bit but then you can get to dipping. I usually go with a trio of bbq sauce, blue cheese dressing, and mustard. But you don’t have to stop there – take out the ranch, mustard and honey too! 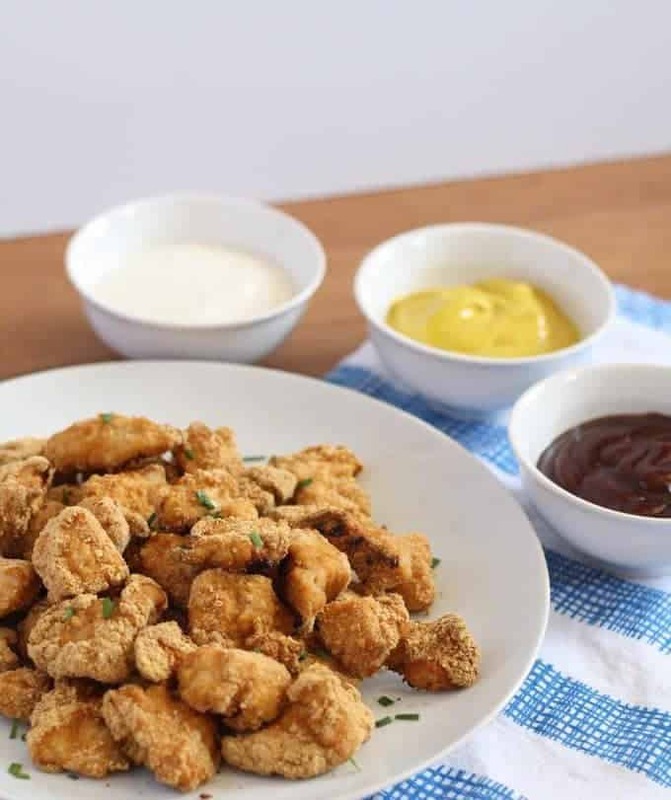 This recipe for baked graham cracker chicken tenders is perfect for a kids' dinner or an adult snack! Easy and delicious! Preheat the oven to 375 degrees F and line a cookie sheet with foil. In a plastic bag, combine the graham cracker crumbs, salt and pepper. Take 4-5 pieces of chicken and dredge them in the egg. 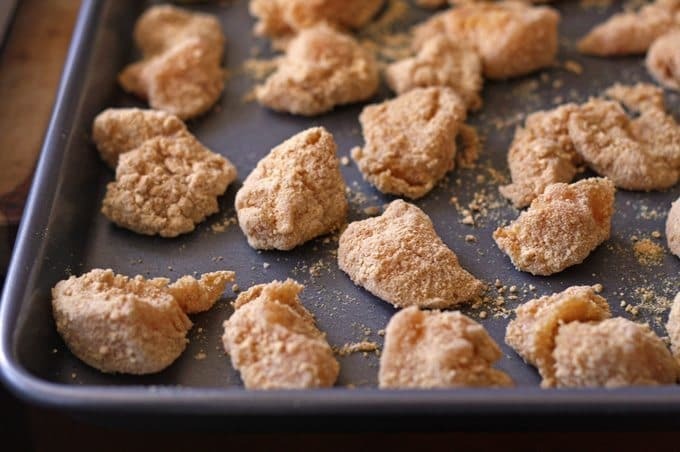 Put them in the bag and toss the chicken pieces in the graham cracker pieces. Remove them from the bag and put the chicken on the cookie sheet. Repeat with all of the chicken pieces. Bake for 25 minutes or until the chicken is cooked all the way through. You can substitute black pepper for the white pepper. Looking for more fun dinner ideas? Try this loaded burrito bowl recipe or this cheesy tomato pasta skillet. This looks sooooooooo goooood! Yummm! This is right up my 4 year old’s alley. We will have to give this a try. Graham crackers, on chicken? That sounds a bit odd. I have used saltine crackers before but never these. If someone offered me one to try I’d try it. I don’t think I would cook it without tasting it first. It’s too bad I can send some to you Lisa! Yummy recipe, thanks Jenny B.
I have t try this! Your’s look so good! I just can’t seem to get a handle on the whole ‘oven fried’ thing. Mine turn out mushy and pale. I think the key to crispy vs mushy is not to over-dredge in the liquid part. Good luck next to you oven bake! I have grahams and chicken!! Thank for the idea. Thanks Richard – I think they’re kid friendly! This sounds interesting and something my toddler would really like. I can’t wait to try this! My kids are going to love this! My kids would LOVE these! What a great after school snack! WHoa! This seems weird and fantastic all at once! I must try this, I would never think to put these flavors together on my own. This looks great i’ll have to try this for my son! We all would love this recipe! Those look great! I love chicken tenders. I would have never thought of using graham crackers for chicken. This is so genius! I would of never thought to do anything like this. What a great way to use up those graham crackers. I will have to try this, they look amazing! I have a box of graham crackers I was wondering what to so with! That’s always how I come up with my more unique recipes! Enjoy Norma! Would never have thought to use graham crackers for these. I bet my 7- and 10 -year-old boys would love them! Lol, chicken tenders are an ageless snack! Ooh, that is too bad! Unfortunately I don’t post a lot of vegan recipes. Sweet and savory in one snack. I think the grankids will love these and they are healthy too. I’m going to try this as part of my meal plan next week! Yum! These look so good! I always have graham crackers in my house- I should give this a try! THANKS! easy recipe! thanks for sharing! 🙂 can I fry those too? deep fry? This looks amazing! Have to try it out! I have some extra graham cracker crumbs too and this would be the perfect way to use them! Pinning and hoping to try it out soon! Thanks Carrie! 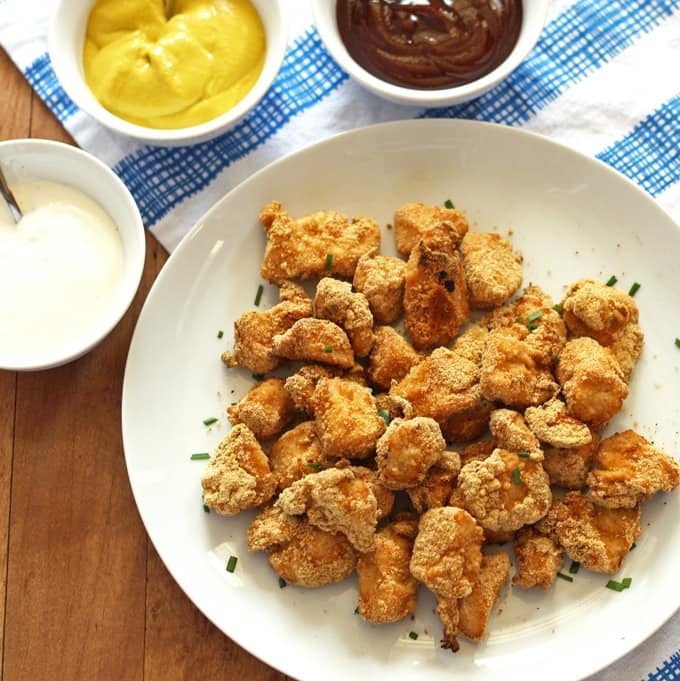 They’re very yummy – and if you have kids they are kid friendly too! This sounds like a winner. Some gluten free grahams and then the yumminess! That would be perfect! I’ll have to try it with the GF graham crackers. What a unique use for graham cracker crumbs. I’d probably toss a little cayenne in there for some heat. Yum, that sounds like a good addition! I am so intrigued by the graham crackers. What a fabulous idea to put on chicken tenders. We rarely eat them but I have been having a huge craving for them. I can’t wait to try them this way. They are very yummy, and easy to make too! These were great! I used chicken breasts and cooked them on a rack. Perfectly moist chicken with a crispy, but not too sweet, crust! 1-yr-old and 3-yr-old loved them. I’m so glad you and your kids liked them! Have a great day! Thank you very much for this great idea! I made this for dinner tonight for my 14 yr old daughter and I. I made it exactly per the instructions. Our reaction was “it’s different”. It didn’t taste “bad”, but it tasted like it was missing something. Adding a little extra salt & pepper helped but it still seemed to lack seasoning. I thought that mixing in a packet of ranch dressing mix in with the dredge would have livened it up. Or maybe even a couple pinches of cayenne & sugar to give it a little spice & sweetness. but that might be something for more mature tastes, instead of let’s say, making it for a child. If I ever experiment with it again I will probably go with the ranch mix. Once again, this was a great idea and although it wasn’t quite what I was expecting, it was still a good change for our pallets. Thank you for your detailed feedback Rob!